California’s Central Valley has extensive floodplains along the San Joaquin and Sacramento Rivers. Some floodplains are managed to provide benefits to humans, wildlife and the environment. 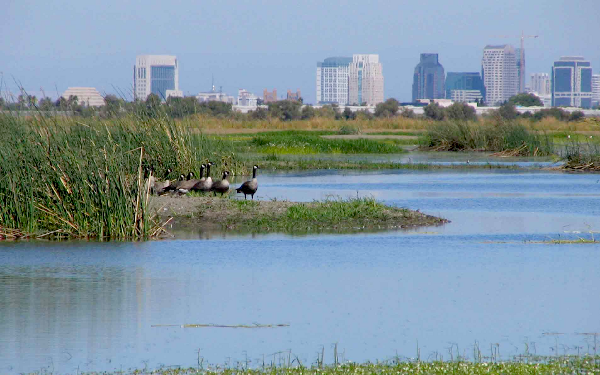 Some floodplain benefits include: waterfowl and other wildlife habitat, breeding and feeding grounds for fish, plant biodiversity, flood water storage and conveyance, groundwater recharge, enhanced agricultural land and recreation. Two areas of major study include the Yolo Bypass and the Cosumnes River Watershed. The Yolo Bypass covers about 59,000 acres and is part of a Central Valley flood control project of levees, dams, bypasses and weirs managed by the California Department of Water Resources. While primarily to protect cities and farmland from seasonal floods, the Yolo Bypass also serves as agricultural land during summer and fall and wetlands during the flood season. Through a public-private partnership, the bypass shows that wildlife, flood control and agriculture can co-exist in an urban and agricultural setting. Sixteen thousand acres of the floodplain have been designated as the Yolo Bypass Wildlife Area, the largest public/private restoration project west of the Florida Everglades. When flooded, the Yolo Bypass provides important foraging and rearing ground for Sacramento splittail and Chinook salmon. At other times of the year, farmers grow rice, tomatoes, grain and other crops. Several landowners in the bypass have created private duck clubs for hunting and other bird watchers visit the publicly managed wildlife area during spring and fall migrations. With so many different uses, the Yolo Bypass presents an opportunity to develop management practices that balance ecosystem benefits with economic and recreational functions—as well as study the potential of groundwater storage. The Cosumnes River is the last river without major dams on the western slope of the Sierra Nevada. Thus it is one of the few systems in which the ecological impacts of natural variation in seasonal flows can be studied. In addition, the Cosumnes River Preserve occupies large stretches of the river's lower reaches and has sought, by means of levee breaches and other strategies to reinstate seasonal flooding, restore riparian vegetation and improve conditions for native plant and animal species. The Cosumnes flows into the North Delta; and at its downstream terminus is the McCormack-Williamson Tract, a leveed Delta island which has been under consideration for conversion to tidal freshwater habitat. In 1998, the David and Lucile Packard Foundation provided seed money to a group of UC Davis faculty (originally termed the Cosumnes Consortium) to conduct studies to help inform management and restoration decisions on the Preserve and in the surrounding North Delta region. These studies --- conducted in collaboration with The Nature Conservancy, the Bureau of Land Management, and other Cosumnes Preserve partners --- resulted in the collection of baseline data and the development of a research design which became the foundation for a 7-year multi-disciplinary study of the ecological response of river and floodplain to annual and interannual changes in runoff conditions. Subsequent work proceeded in several phases, and expanded to include focused investigations of the potential for reestablishment of fall flows in the Cosumnes and of restoration options for the McCormack-Williamson Tract.